This paper by Hyun Song Shing, Global Bank Glut and Loan Risk Premium, has already been flagged by Paul Krugman and Tyler Cowen a couple of days back, but with rather brief commentary. I found the paper absolutely eye-opening and wanted to alert my readers to it with more emphasis - if you hadn't already gotten this perspective somewhere else it's very important to take it on board in thinking about the world. The graph up above shows the amount of assets (above the x-axis) and liabilities (below) of "foreign" banks with respect to different currencies. As you can see, the US dollar is far and away the most important currency for international bank holdings, with the Euro a distant second. 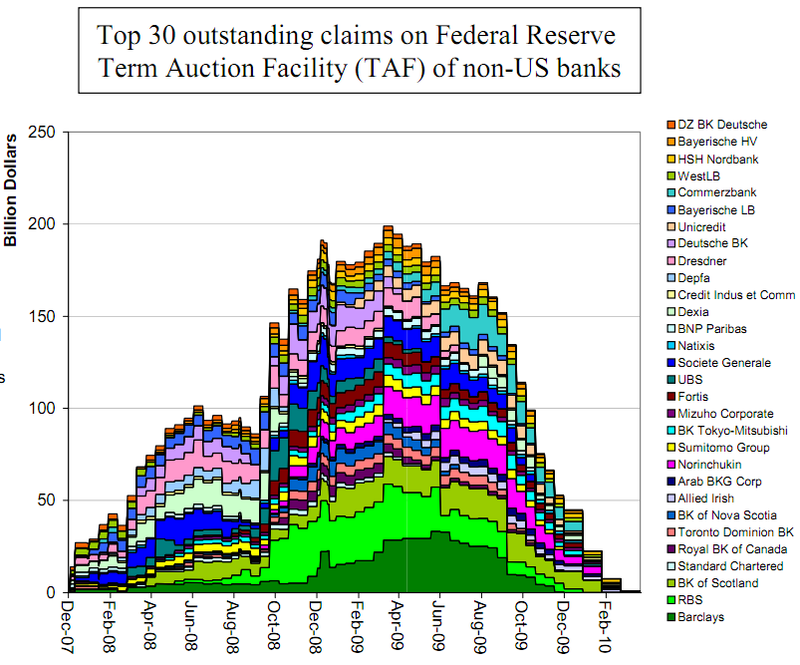 But note the scale here - non-US banks peaked at over ten trillion in dollar-denominated assets/liabilities, and still today have around nine trillion dollars in assets/liabilities. Recall, for comparison that US GDP is currently running around $15 trillion/year. So foreign bank assets/liabilities in dollars are of the same order of magnitude as the entire US economy. 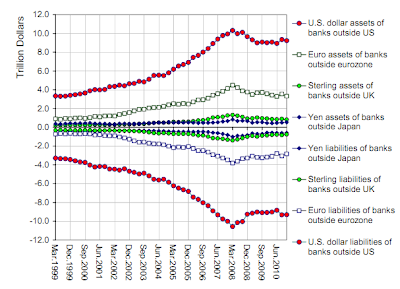 This shows the total assets of US commercial banks (ie BofA, Citibank, Wells Fargo, etc) as compared to the dollar denominated assets of non-US banks. The two are of roughly equal magnitude. 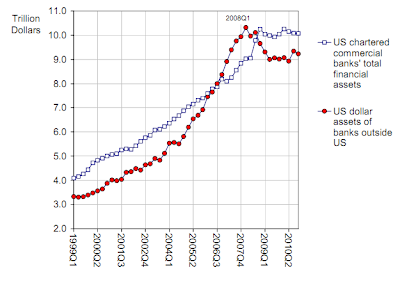 It's also striking that the main contraction as a result of the 2008 crisis came in the non-US banks. So the picture is that there are two banking systems of roughly equal size operating in dollars - one headquartered in the US and the other headquartered in Europe. 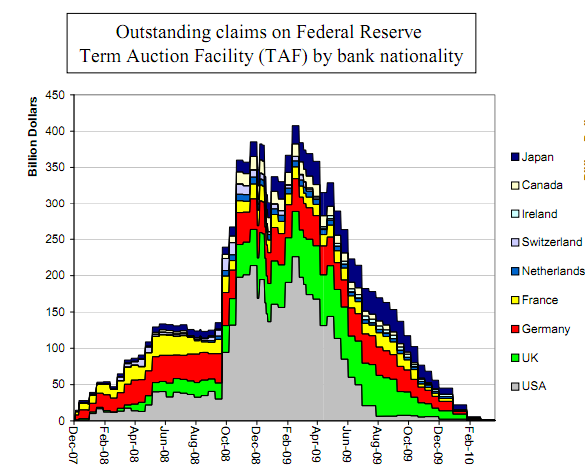 This should make it clear why, when the US financial system started to go bad as a result of the bursting of the housing bubble, problems almost immediately started showing up in European banks. 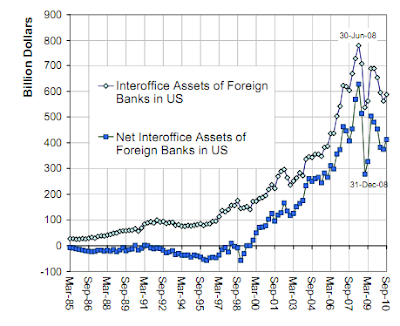 We would normally expect a negative number for the net interoffice assets of foreign banks in most countries, since the role of the branch is to bring funding from head office to operate local assets. However, the US is very special in this regard. Net interoffice assets were, indeed, negative in the 1980s and most of the 90s, but in 1999, net interoffice assets surged into positive territory and increased steeply thereafter. Rather than being a lending outpost for the parent bank, the US branches became a funding source for the parent. So, as long as the financial crisis has been confined to the PIIGS, the US has been only moderately affected. However, in the worst case scenario where banks of core European countries begin going under (eg if the Euro starts to come apart altogether and the individual countries are not all able to rescue their banks in the chaos) the US financial system will be immediately and dramatically affected (for example, if important money market funds "break the buck").